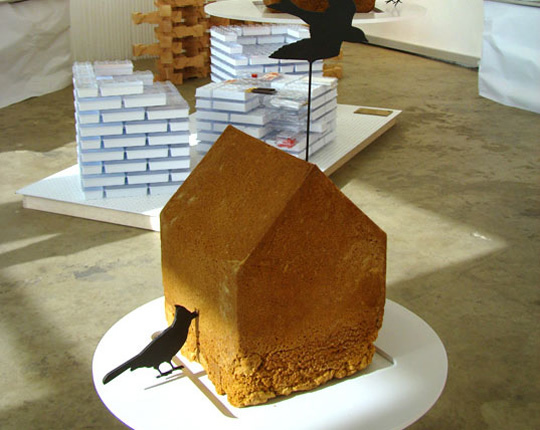 Dough-Dough is a disposable bird feeder made of cookie dough, molded and baked in a sheet-metal mold, that gets literally consumed and "disposed of" as birds peck away at it. Made with the help of Maury Rubin of City Bakery. 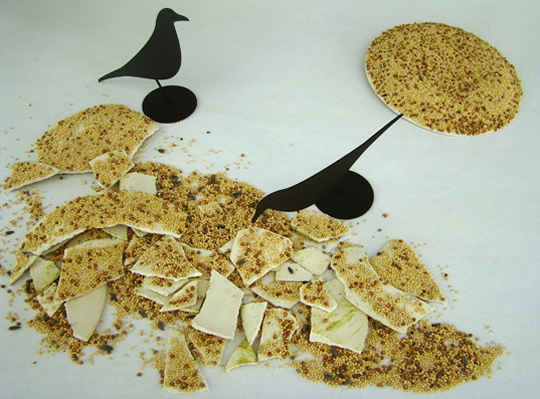 The UFO / Unidentified Feeding Object is a picnic plate made from a composite of blended birdseed, potato starch, guar gum, and a seaweed-like binding agent, designed to be used once and then thrown, like a frisbee, so that it shatters and becomes food for animals. "Rigid and lightweight, UFO is highly resistant to wet foods, vinegars, and sauces—yet completely biodegradable, non-toxic, and vegan." 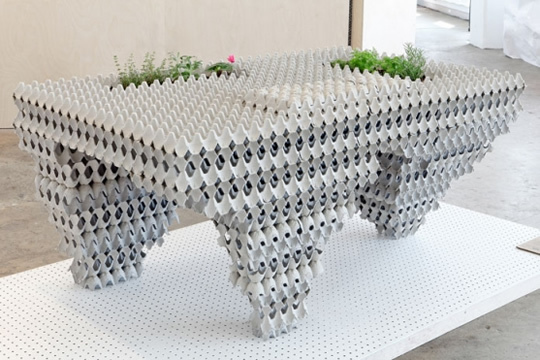 The Auto-Cannibalistic table is made of paper egg flats, flour paste, soil, and seeds — and once water is added, the seeds germinate, so that the table ends up eating itself. "Why can’t a table eat itself? Tables support food, but why can’t they also be food?" says Atema.